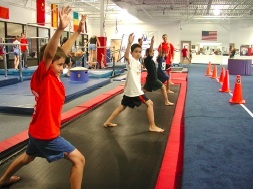 During the school year, the gym opens its doors to any gymnast who wishes to workout on any events they choose. Open gym is entirely supervised by our staff. Gymnasts are not permitted on any apparatus without supervision. All participants must stretch properly before beginning any activity. All students must sign in and pay a cash fee before entering the gym.